Sited on what remains of the historic fighter airfield at Hawkinge, the museum seeks to keep the memory of the Battle of Britain alive. 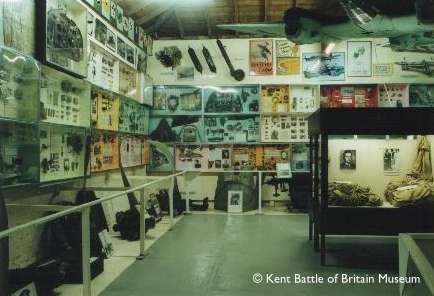 The museum opened in 1981, initially using the old control tower, but has now expanded to occupy five buildings. 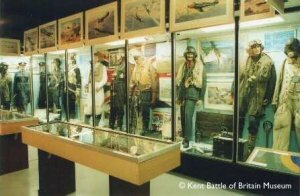 A large collection of full-scale replica aircraft are on display, several being constructed for the ‘Battle of Britain’ film. Components from up to 600 crashed aircraft are also on show. copyright, we regret that no cameras, video recorders or any other type of recording equipment (including notebooks) are allowed in the Museum’. This ban is rigorously enforced and has been in place for a number of years. The object of the ban is to minimise the risk of theft from the museum, by not drawing outside attention to specific items that are on display. 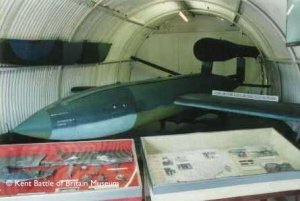 Theft of aeronautical artefacts has become a growing problem over the past few years, and the Museum suffered a loss of an exhibit recently to criminal activity. Signposted off the A260, north of Folkestone, Kent. Open daily Easter Good Friday to October 31st: 10.00 am to 4.00 pm, April, May and October; 10.00 am to 5.00 pm, June to September. Closed on Mondays, except for Bank Holidays. Last admission one hour before closing. Closed 1st November to the following Easter. Toilets, Parking, Cafe, Souvenir shop, Access for the disabled. FSM = Full Scale Model. Thanks to Matt Nixon for permission to use these photographs. nice do they actually have the supermarine spitfire prototype? if they do, wicked! also,do they have 3 BF / ME 109’s? and where they all real ones? Forget having your mobile phone with you aswell!. Aircraft replicas are not worth seeing!, better off going to a real museum where you can at least take pictures!. What a strange policy. With so many wonderful and welcoming museums covering this important era around the county of Kent and the rest of the south east there really is no reason to waste your time and money at places with such an unfriendly and suspicious attitude towards their visitors. Nice enough little museum but appalling attitude towards visitors– ignorant,rude and aggressive ticket seller “greeted” us after a very long journey. Visitors tolerated but definitely not welcomed. Could do with some updating of tags and a general clean up wouldn’t go amiss.The local taxi drivers weren’t even sure where it was and actually advised against a visit based on what they had heard. Said it all–they were right. Having just had my attention drawn to this from a website I really had to comment. The staff are rude, offensive and unhelpful and confiscated a notebook from my eleven year old son, tearing out pages he had made notes and drawings on. It was a shame because on the way out I was going to introduce myself and explain that Grandad was involved in guarding wrecks in 1940 and I have his photos (dozens of them!) and souvenirs he collected. They wont be getting them now – or ever. unbelievable gripes on here about staff! what did you all go there for the staff? the photos?..we have been many times, live locally have taken many visitors over the years ..All love it!..very emotional for the older ones who remember the war days..the reason the taxi drivers do not know about it is that it is never advertised locally as it is such a gem, and security reasons etc..most visitors come from outside the area..personally I think the local volunteers are doing a marvellous job, maybe act a bit suspicious as they really value these items..given a chance there are actually visitors that would pinch them!..would reccommend to all!! I entirely agree with the negative comments re staff at this establishment; I have never been to any other museum where the staff were as offensive as here. I visited about four years ago – never again. One of the two staff on duty lauched in to a tirade about the aircraft enthusiasts who had been arrested in Greece not long before; he was of the opinion that they should have been burnt at the stake! No punishment was too bad for them: I could have been a relative of one! There then followed an outburst on the general stupidity of entusiasts in general Because I politely disagreed, this “gentleman” told me to f**k off and the f-word was used most liberally thereafter. A thoroughly unpleasant experience. I went on to visit the Romney, Hythe & Dymchurch Railway where the attitude of the staff was completely the opposite. I am frankly astounded that this museum is still in existence and can only think that it is run for the benefit of the staff themselves. Don’t bother to go there! I totally disagree with the comments abount the staff!They were really helpful,and they were plenty of notices up in the car park warning you that you could not take your mobile phones our cameras in the museum.A really a good museum I will be going back soon I hope!PS If battle of britain is your thing then this is the best musuem in the UK to go to! I have visited this museum ages ago, before the draconian ban. I only know of one other museum (a car museum near Great Yarmouth) that imposes a ban on photography. While I understand the reasoning, the staff assume that those with cameras etc. are ‘casing the joint’, I suspect in reality thefts are more likely from dodgy characters cutting the fence. Why not charge a £5 for a ‘photography permit’ like some places do? I was more disappointed that the exhibits are virtually all replicas. Might as well visit Airfix. my wife and I and 2 friends visited this museum recently although yes there was a camera ban inside for security reasons I can understand ,, we thoroughly enjoyed looking around this site and really didn’t find much that we could take photos of inside the staff were really helpful too my wife who was in a wheelchair and really knowledgeable when any questions were asked . We had a nice snack in the gardens and the food was of high quality. Read all the above comments and decided to visit the museum. Didnt believe that it could be as stated above, after all the aircraft are mainly Full Scale Models so why the photo ban. I was proved wrong. The staff are not pleasant and need training on customer service. They may be volunteers however if they dont want to be there they shouldnt go. The exception are the ladies serving food. The food was good too. 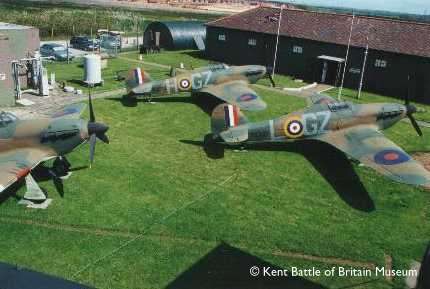 Not a museum for aviation enthusiasts though unless you like models. 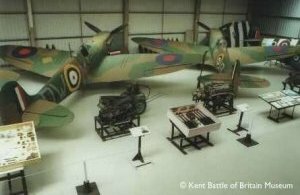 I was thinking of taking a School group to the museum in June, but having looked at these comments I think Manston Museum may be a better move. Indeed, you cannot take photographs. And yes, it is not a museum aimed at aircraft enthusiasts / spotters. With regard to the staff, well we are used to look around for ourselves anyway! So after paying we went on exploring. Pity you cannot pay by card (handy for us Europeans), the staff was helpful in pointing us to the nearest atm though. What to expect? Hundreds of artifacts neatly displayed and with storyboards on the individual aircraft, unit, mission and f possible the pilots that flew that aircraft, in *every* cabinet. I have visited hundreds of aviation museums over the world and I do not know of any other museum that has this amount of meticulously documented individual crash site displays with some unique remains of aircraft. True, most are small parts only, but just stop and read some of the stories and it starts dawning on you how much work has gone into this! As aircraft spotters, maybe we “only logged a couple of real aircraft”, but appreciated the uniqueness of this museum just the same! Visited yesterday. Thought the staff were helpful (as much as we needed them to be) and apologetic over the camera ban and explained it fully. Great museum with so much to see. Travelled 250 miles each way to see it. Definitely going again. Wife & I went there at beginning of August. We were sold a ticket … and left alone. Which I greatly appreciated. At first, I thought that I (BoB ‘student’) would not find anything interesting because there were so many different parts displayed. But then, I began to read the stories that the staff had put together … and was moved! I had questions, went to the front office, met Derek and David there. Not only did they answer all of my questions in detail. Derek took me to the exhibits and explained ‘in situ’ what the display is meant to say. 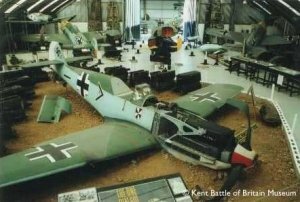 As a German ‘studying’ the BoB, I was of course interested not only in the British side of that battle, bu was intrigued about te artifacts of downed German pilots and their aircraft. Derek led me to their showpiece, the Me 109 of U. Steinhilper whose aircraft was excavated in the 80ies. I knew Steinhilper’s story (his books) and was impressed by the meticulous love of detail with which his story was presented. I think that is a good example and testament to the diligence and love of detail that the staff of KBoB has shown with all exhibits. At the end when my wife was dragging me out of the houses, I asked if I could take a picture – and Derek took me to the Hurricanes and posed with me for a photo! I remember both the museum and the staff – Dave and Derek – very fondly, and I will definitely come back!